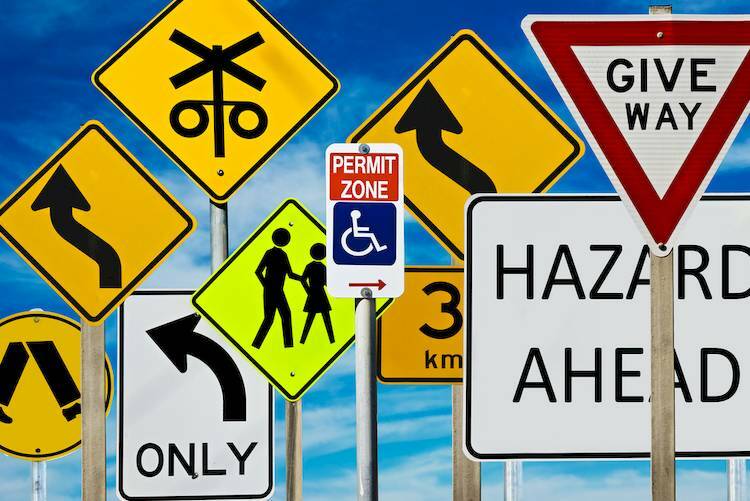 While you know that most road rules are based in common sense, many others are in place to make sure you and other drivers are safe while on the roads. Even if you are familiar with the laws in your own state, other state could have different rules. The following are the rules of the road for Arizona drivers that may differ from those in other states. Drivers and passengers in the front seat must use a lap and shoulder belt if the vehicle is equipped with them. If a lap belt is present (on vehicles manufactured before 1972), it must be used. Children age eight and under must be in a safety or booster seat that is appropriate for their height and weight. Children under 12 are not permitted in the front seat unless younger children are already secured in the back seats of the vehicle. Drivers must signal the direction in which they intend to turn a minimum of 100 feet before turning. Drivers turning right after an intersection should not engage the turn signal before entering the intersection. Right of way is not given to a specific vehicle by law. If taking the right of way will result in a crash, drivers must yield to the other vehicle regardless of who should yield. Pedestrians always have the right of way, even if crossing illegally or jaywalking. Drivers must yield right of way to funeral processions. Passing on the right - Passing on the right is only permitted if two or more lanes are moving in the same direction in which the driver is traveling. Driving off the roadway to pass is not permitted. Gore area - It is illegal to cross the “gore area,” which is the “V” that occurs between the on or off ramp lane and the merging lane when entering or exiting a freeway. Emergency vehicles - Drivers can’t drive or park vehicles within the same block of a responding emergency vehicle. HOV lanes - Arizona has HOV (High Occupancy Vehicle) lanes. It is illegal to drive in these lanes with less than two people Monday through Friday during the posted times. Red arrow - A red arrow on a traffic light means the driver must stop and wait for the arrow to turn green before turning. Move over law - Drivers are required to move one lane over when a vehicle with flashing lights is on the roadside. If doing so isn’t possible, drivers are required to slow down and drive cautiously. Curbs - Drivers must follow curb colors. White is an area for picking up or dropping off passengers, yellow is designated for loading and unloading and drivers must remain with the vehicle, and red means that stopping, standing and parking are not permitted. Road rage - Drivers who combine actions such as failing to follow traffic signals and signs, passing on the right, tailgating and changing lanes in an unsafe manner can be cited with aggressive driving/road rage. All vehicles must have intact windshields and front side windows. All vehicles must have working turn signals and emergency flashers. All vehicles must have mufflers. Working horns are required on all vehicles. Following these Arizona rules of the road will make sure you are safe and prevent you from being pulled over or fined while driving throughout the state. Make sure to check the Arizona Driver License Manual and Customer Service Guide for more information.